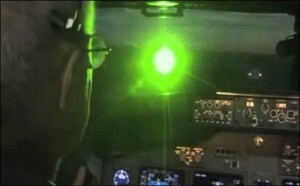 The FBI reported an increasing number of lasers being pointed at aircraft and pilots in the New York area, CNN reports. The 17% increase is concerning because lasers can temporarily or permanently blind a pilot or crew. Earlier this year, several pilots suffered significant eye injuries, including a burnt retina. On Tuesday, at least two incidents of green lasers were reported, according to CNN. Posted: 10/21/13 at 8:42 AM under FBI, News Story.